If there is anything currently uniting most political commentators in contemporary America, it is surely their on-going fascination with the presidential campaign of Donald Trump. The common agreement on both sides of the political aisle through most of 2015 appeared to be that his campaign was eventually bound to fail - the reason being some version of the Jeb Bush position that Donald Trump, far from being a serious candidate, was actually a "jerk." But labeling him in this fashion was - and remains - misleading in two very critical ways. The first is that it puts far too much emphasis on the personal characteristics of Trump the man, so ironically fuelling the narcissism which is so potent a feature of how the Donald continues to campaign. The other is that critiquing him pulls our attention away from the group of die-hard supporters who still flock to his every rally, and who give every impression of liking him precisely because, to Establishment-Republicans at least, he is definitely a jerk. So who are these die-hard supporters, and why are they drawn to support Donald Trump's candidacy with such fervor? Answering that question is a vital pre-requisite to eventually keeping the White House safe from Trump's hands. For none of us will manage that if we don't first understand - and then address - the concerns of that very special breed of American who is now so keen to see a Trump presidency. Three features of the core Trump support stand out, and all are now well documented. The first is that his support is heavily concentrated in just one major social demographic: Joan Walsh described it as "Republican voters who didn't go to college," - conservative Americans, that is, now surviving on the very bottom rungs of the generally-threatened US middle class. The second is that the level of anger among that particular group of Americans is at a new and unprecedented level. Many of those turning to Donald Trump for political leadership support him precisely because they are critical of, or actively angry with, the existing political establishment - and see Trump as attractive because he is not part of that establishment. And the third is that the current set of hard-core Trump supporters are - and intend to remain - loyal to him and his cause. If Frank Luntz is right, "half will follow him out of the Republican Party if he breaks his promise and declares as an independent." Support, anger and loyalty - three features of the Trump electoral base that need to be fully understood by those who would reject him. Let's review them here in reverse order. When solid and committed Trump supporters are asked to explain their enthusiastic endorsement of a candidate prone to say outrageous things, one dimension of his appeal that often surfaces is his willingness to challenge conventional understandings of "political correctness." His supporters like him because "he calls it like he sees it." They like him because he moves into the center of the public conversation views and ideas which many of his supporters also hold, but which in the recent past was thought, even by them, impolitic to say. They like him, that is, for the very reason that the Republican Party establishment does not: that in campaign speech after campaign speech, he makes explicit so many of the underlying premise of the Party's "southern strategy" first put in place by Richard Nixon. For the last four decades, Washington-based Republicans have been perfectly willing to garner white votes in the south by tacitly going along with residual southern white racism. They just haven't wanted to admit that: and they still don't want to. Instead, they label southern racism "parental choice" in relation to school selection. They call it "rolling back welfare dependency" in relation to the sustenance of the American poor, many of whom are black or Hispanic. They call it "supporting law and order" when police officers shoot black teenagers; and they call it "tax reform" when they denude the public school system of the funds necessary to ensuring that no black/Hispanic student is actually left behind. The Donald doesn't do that. He calls Mexican immigrants criminals and racists. 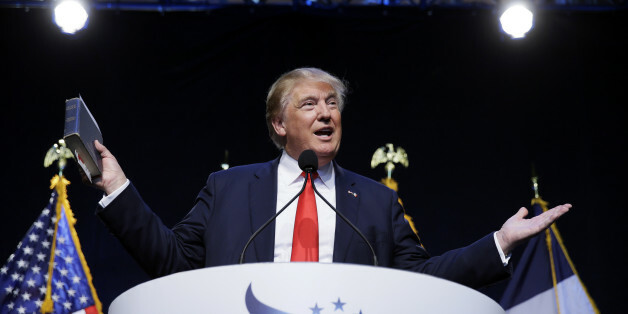 He calls for immigration policies that treat all Muslims as potential terrorists. He even dismisses pushy female journalists as menstrual, or liberal disabled ones as worthy of parody. His supporters like him for some/all of that, depending on the character of their own conservatism. They like him because political correctness has kept them publicly silent for too long, and because he makes a virtue of treading right over every politically-correct line. Anyone wanting to defeat Donald Trump will have, therefore, to persuade a very tough audience that political correctness helps protect them as well as those they privately denigrate. No doubt, core Trump supporters are angry for lots of reasons, only some of which the Trump campaign addresses directly. But at the very least, it hardly damages Trump's cause, among those white voters unhappy with a black man in the White House, that their man was an active 'birther' and still leaves open the question of the president's citizenship. Being tough on immigrants also helps bind him to that group of American voters - normally white, often male and invariably middle-aged - who was most disturbed by the changing ethnic composition of the United States (with their white majority status projected to vanish in many states by/before 2050). He certainly gains supporters among that same group when he criticizes trade pacts that outsource American jobs and patterns of business deregulation that privilege Wall Street over Main Street; and parading around accompanied by all the trappings of wealth does not alienate him from conservative white males - it helps glue them to him. Donald Trump is increasingly presenting himself - in spite of his own billionaire credentials - as the champion of non-college educated American voters. Currently, "half of Trump's supporters within the GOP stopped their education at or before high-school graduation....Only 19 percent had a college or post-college degree. Thirty-eight percent earned less than $50,000. Only 11 percent earned more than $100,000." These are members of what Robert Reich recently labeled "the anxious class.... Two thirds of whom are living paycheck to paycheck. Most could lose their jobs at any time." These are men (and to a lesser degree, women) whose wages have stagnated now for over four decades, whose job security was ripped away by the recession triggered from Wall Street in 2008, who often now struggle to make a living wage, and who are in consequence increasingly denied their chance of living the American Dream. Many of them feel threatened from above by the entitlement culture of the super-rich, and even more threatened from below by the demand for equal rights for groups even more disadvantaged than they are. Few of them have the spare resources, week-on-week, to fund federal/state welfare programs through higher personal taxation. Most indeed lack the spare cash to sustain the private charitable giving that so many of them still prefer. The Trump choice of timing and theme makes sense to Americans struggling to hang on to their middle-class life-style and status, because particularly white, male, non-college educated voters are having a tough economic time as the traditional American middle class increasingly erodes. Members of that demographic are even dying earlier at a greater rate now than in the immediate past, the victims of their increasing consumption of both alcohol and drugs. Their world is not going in a direction that they personally favor. Donald Trump is promising to pull that direction back in their favor, playing on both their anger about the present and their apprehensions about the future. Anyone wanting to defeat him will need, therefore, to persuade a very tough audience that Donald Trump's explanation of their present and future condition is wrong, and that theirs by contrast is not. Donald Trump's current political problem is not that he has the overwhelming political support on older and less educated voters. It is that he is over-dependent on that demographic: one that is "less affluent, less educated and less likely to turn out to vote." His problem is that by playing to their concerns he effectively alienates other voting blocks that are socially adjacent to them but are more disadvantaged even than they are. Defending police violence is hardly the way to win African-American votes. Promising to expel 11 million undocumented voters hardly sells well in the Hispanic community. Trump is not a single-issue politician, but he is currently too much a single-constituency politician for his own long-term good: his 27 percent support among Republican voters in December currently translates into support among only 13 percent of the American electorate as a whole. That single-mindedness may win him the Republican nomination, but it will also likely create problems for him in the general election that follows. If loyalty, anger and support are all key elements in Trump's current dominance of the Republican presidential field, rolling each back - and doing so in a progressive manner - is equally key to ensuring that that dominance does not persist into the general election itself. Progressive politicians will never win over the racist element of the Trump coalition, and nor should they try. But they can - and must - win over that section of the white working class that is pulled to Trump by their general anxiety about economic conditions and future prospects. The question, of course, is exactly how: and here the traditional Democratic method of coalition-building may actually get in the way. Habitually, Democratic politicians try to build their winning coalition by adding constituencies together: not least of late African-Americans given daily proof of the need to insist that black lives matter; Hispanic voters who want a route to citizenship for an undocumented Spanish-American working class who contribute so mightily to the success of key industries like agriculture and hospitality; and working women struggling to break glass ceilings while often attempting to combine paid work with the rearing of children. Women, that is, who are and regularly pushed towards poverty by a wage system that pays them only 79 cents on the male dollar. The premise of so much of the Democrats' political campaigning in 2015 appears to be that the white male working class that is drifting towards Donald Trump is simply another constituency to be added to the rest. Both the Sanders and Clinton campaigns seem currently to be treating that addition as ultimately a simple and straightforward one, because neither campaign seems willing to concede that, at the bottom of the US income ladder, the immediate economic interests of groups do not naturally align. It is an error of analysis that Trump does not share with them, and it is one that may yet let Trump in. If they are going to stop Donald Trump in his tracks, both Hillary Clinton and Bernie Sanders need to build their 2016 campaigns on the explicit recognition that, as American capitalism is currently organized, different sections of the American poor and near-poor do compete with one another for limited resources (for jobs, wages and welfare benefits); and that in consequence there is an explicit strategic choice to be offered to those various constituencies in November - and particularly to the angry ones. It is either for potential voters to go on treating each other as competitors to be defeated/excluded - the Trump way - or it is to come together - the progressive way - in a joint endeavor to reform a system that sets similarly-placed people in such fierce competition with each other. The politics of exclusion are the politics of Trump. The politics of inclusion have to be ours. Donald Trump may be promising to make America great again, but he is not promising to remove the competition between ethnic groups at the bottom of the US class structure for a limited set of employment opportunities and social resources. He is not, but progressives must: for unless the American Left can demonstrate how its policies, and its alone, can raise all ships, right-wing populists like Donald Trump will continue to play group against group, to the long-term mutual disadvantage of them all. It is always easier to blame other victims for a shared condition. That is why the Trump message resonates so strongly among a certain group of angry, white middle-aged and anxious voters. But playing the blame game just reinforces the system that makes the allocation of blame necessary in the first place. Which is why progressive politicians need to develop and advocate for an entirely new way of running the American economy that does not require the setting of one group of the vulnerable against another. It is also why there is no more important task before us now than that of redirecting the anger and frustration that so many Americans feel - redirecting it away from its focus on people and groups who are our immediate neighbors, and directing it towards against the properties of an entire economic and social system that only survives by setting neighbors against each other. What that means, in immediate campaigning terms, is this. It means bringing issues of social class back into the center of the political debate. It means anchoring discussions of racial and gender discrimination (real and powerful as those are) in a wider conversation about general social inequality and capitalist power (large parts of which are less visible but more potent still). It means doing what Bernie Sanders does best - proposing redistributive taxation to correct the theft of wealth and income by the top 1 percent - and it means doing what so far neither Bernie Sanders or Hillary Clinton do sufficiently well: articulating a growth strategy for the entire US economy that can do the two things that the alternative Republican free-trade/austerity growth strategy cannot. Articulating a progressive economic growth strategy that can pull well-paid manufacturing jobs back to the United States, in the process beginning to ease the anxieties of a middle class historically so dependent upon them. And articulating a progressive economic growth strategy that can raise all ships - one that can generate growth by anchoring prosperity at the bottom of the income ladder, so lifting the daily pressure of inadequate paychecks from the shoulders of more and more hardworking Americans. For far too long, Washington-based Democrats have remained wedded to trade policies that outsource American jobs (the Obama Administration still is) and to triangulation with Republicans that block the strengthening of trade unions and labor rights (as the Clinton Administration did so spectacularly in the 1990s). Both those things have to end, and to end immediately. The only way to win in November is to out-trump Trump at his own game: to expose him for the peddler of half-truths that he is, and to replace those half-truths with the realities of an America that is still in need of root-and-branch progressive reform. The only way to roll back right-wing populism is to beat it at its own game by developing an even stronger form of left-wing populism. That is the progressive task par excellence for 2016. A year dominated by left-wing populism will not only guarantee success against Trump and his ilk in November. It will also turn the general election of 2016 into an election which is genuinely worth winning. For a fuller statement on the articulation of class, race and gender in contemporary capitalism, see David Coates, Capitalism: The Basics. New York: Routledge, 2015.